Davis (2004: 1189) provides a recent index of US industrial production. Davis used 43 annual components of manufacturing and mining industries in the US, which represented about 90% of manufacturing output in the 1800s (Davis 2006: 105), so that his index seems to be a reasonably good proxy for real US GDP in the late 19th century when the manufacturing sector had become a dominant part of the US economy. 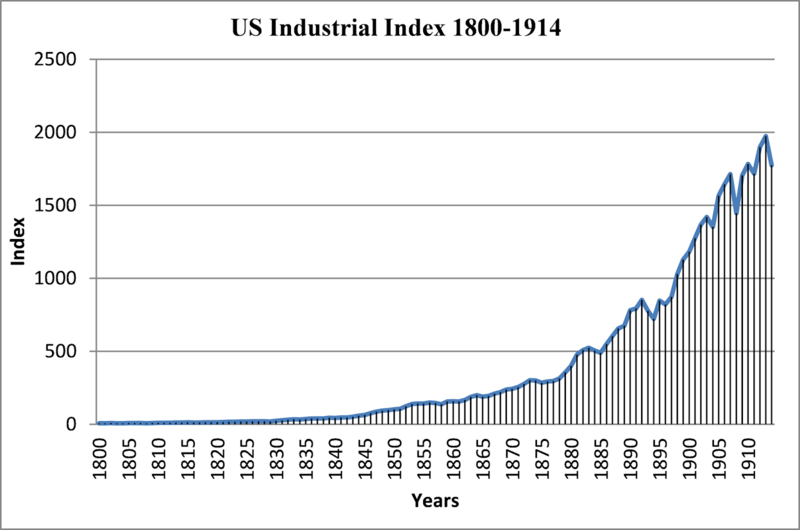 Even with so many years are covered in this graph, it is still possible to see the recession and stagnation of the 1870s and the double dip recession of the 1890s – the two very serious US economic crises of the late 19th century.